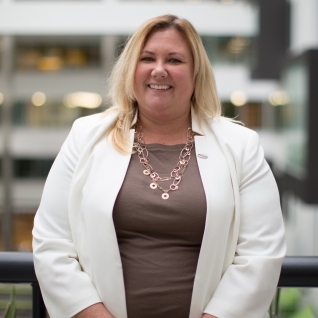 Jen Reigle, PE, is a Senior Engineer at Pennoni's headquarters located in Philadelphia. She has 17 years of experience engineering and managing bridge design, rehabilitation and repair projects. Her noteworthy projects include I-276/I-95 Pennsylvania Turnpike Interchange Project consisting of two (2) bridge replacements and two (2) bridge repairs; SEPTA's Crum Creek Viaduct Replacement Project and the 2012 Greater Philadelphia Preservation Alliance's Grand Jury Award Winning Rehabilitation of the Rapps Dam Road (SR 1049) Bridge over French Creek. Jen received her BS in Civil Engineering from Penn State and her MS in Engineering Management from Drexel University. She is currently the ASCE Philadelphia Section Treasurer. The most enjoyable aspect of my career is the satisfaction of seeing the positive impact rehabilitating a deteriorated bridge, or designing a new crossing, has on the surrounding community. In addition, the sense of pride I feel when seeing the fully constructed design that my team and I created on paper (or on the computer screen). What I really love about my current position is being a part of the development of younger engineers and being able to see the accomplishments that they achieve. I am looking forward to many more years of this! What advice would you give a student currently studying engineering? I would urge all students to take advantage of every engineering experience offered to then become involved in engineering societies and start establishing your network while in college. You never know, one of your classmates may become your boss or client years down the road. Lastly, know that you will never stop learning even when you are no longer in college. What has been the greatest challenge you have faced in your career so far? My greatest challenge thus far in my career has been deciding what my next goal would be and what direction to take it in after receiving my Professional Engineering license (PE). The PE is one of the greatest achievements in a civil engineer's career and for me, obtaining it was all I concentrated on for the first five years of work in this field. Once I obtained it I had to ask myself, "now what?" I considered going back to grad school for a technical degree based on the current work I was performing, pursuing lobbying and/or politics in relation to the field of civil engineering due to my involvement in Government Relations via ASCE and ACEC, or exploring project management and business development. Ultimately, I pursued a career path in project management. This challenge allowed me to realize the various aspects of the civil engineering field beyond what I had studied in college and the first few years of my career.